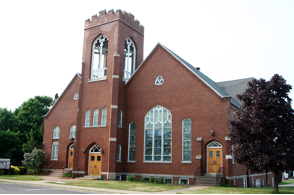 The Williamson Presbyterian Church - the red, brick church on Main Street - will be serving a spaghetti dinner on Saturday, March 12, from 5-7 PM. All proceeds from the dinner will support the Youth Group’s bi-annual Midnight Run Mission to homeless persons in New York City. The dinner costs $6.00 for adults and $3.50 for children 8 and under. Every other year, those who have shown “Christian leadership” in the Youth Group stay just outside New York City, where they work at a work camp to offset their housing and meal expenses. But for one night, they travel into the heart of New York City as part of the famous Midnight Run Missions, providing donated clothing and food to people living in the city streets. The teens describe this journey as “life-changing.” Parking is available in back of the church, near the entrance used for the dinner. Please call 589-8260 for more information. 0 Comments to "Spaghetti Dinner Benefit - Williamson Youth Homeless Missions"